Siberian climate, as is known, it is characterized bylate spring, summer and short-lived severe winters. To withstand such conditions, plants must initially be zoned in a local climate. Those. by the degree of survival leading seedlings grown in nurseries Siberia. 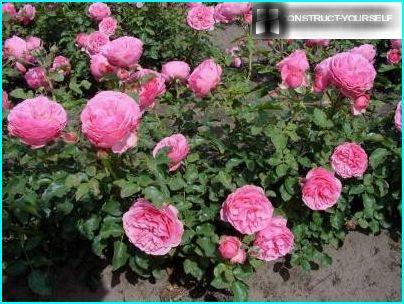 The second place was given to Canadian gardeners roses, because the climate in this country is similar to Siberia. But the real Canadian rose, unfortunately, are rare. This category of plant is too attractive to buyers, so it is most often counterfeited. Canadian varieties is better to buy only from a reputable supplier, and, of course, not with the hand or on the market. The second selection criterion - vaccination. According to statistics, the grafted varieties of roses in Siberia is much easier to tolerate the winter and not freeze, because they have higher immunity. Rootstocks for varietal roses is usually the wild rose, and his immune system is much hardier than that of their own root roses. 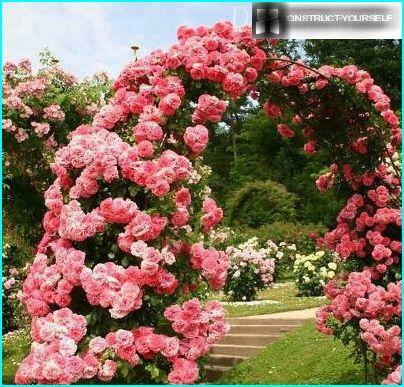 It refers to the Climber group, ie large-climbing roses. It can be grown and how shtamb. It blooms dark pink petals with a gradual burnout. Flower size can reach 12 cm, but the colder the climate, the smaller will be the inflorescence. Approximate size of flowers to Novosibirsk -. 5-6 cm Rosarium Uetersen love for resistance to fungal infections, repeated flowering (first - the most abundant, and after - waves). Strong stems are not afraid of frost, no wind. Gardeners can ruin this rose except that an incorrect laying in the winter, when the stems from the unfortunate breaks the selected stacking direction. It grows inordinately tall shrub to 3 meters. German variety, adorable in Siberia for continuousbloom. This rose awakens and blooms very early, and then are left without flowers. The flowers change color from bright orange to apricot and salmon. In diameter -. 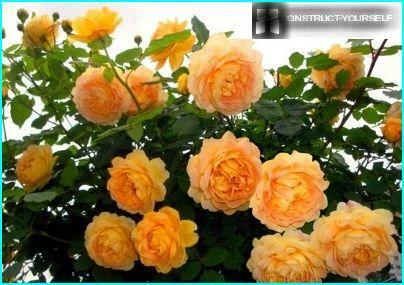 10 cm Has ADR certificate as one of the most hardy roses. A descendant of American roses. Flowering pale pink, fragrant flowers almost the entire season. She gardeners Siberia nicknamed "Very," ie, very hardy, very unpretentious (grows everywhere), very prickly, very fragrant, etc. The only caveat:. there is recent New Dawn specimens that bloom only once. Therefore, before ordering specify the number of blossoms, or you might see this beauty only once, at the beginning of the summer. Angliyskaya rose new generation, nurturedinternationally renowned breeder David Austin. Blossoms rich velvety red flowers, gradually turning into a purple hue. 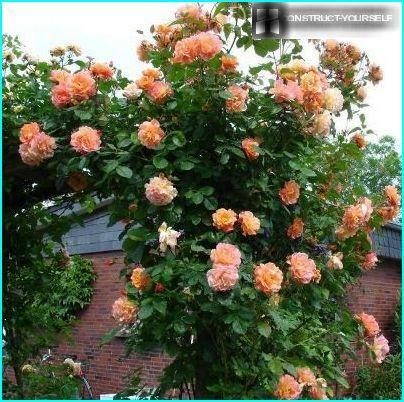 Fragrant, medium height (up to 110 cm) on each branch forms a lot of flowering brush. When buying, pay attention to the presence of figures in 2000, since there is also the ancestor of the rose - William Sheakespeare, which is not such a high immunity to fungal infections. Another pet David Austin. Blooms twice, bright yellow large flowers, like balls, exudes a lemon-caramel flavor. In cold climates, it grows up to six meters high. Almost is not subject to disease, but a black spot. It looks great in mixborders. Due to the fact that the spring begins late in Siberiaand sunny days per year is not very much, try a rose planted on the south side. But a completely open area is not very profitable, because the flowering period is considerably accelerated, and the flowers fade in the heat. It is best to consider a light partial shade using redkolistnyh shrubs or trees. Roses are planted next to them in such a way that during the hottest time of the day defending their foliage "neighbors". It is desirable to select for rosary high placessection. There's a degree of freezing of the soil is always smaller, and hence the roots wake up faster. This will save the plant and from the moisture, which is typical for the lowlands. Too much moisture causes the development of rot and fungal infections. In Siberia, the frequent strong winds, and coldfront coming from the north and from the west. With these directions (north, north-west and north-east), roses need protection in the form of buildings, gazebos, live conifer hedges and so forth. But the wall has to be at such a distance so as not to cast a shadow on the bushes. For the Siberian climate desirable springplanting, and their life is much shorter than in other areas. Planting season starts in May, when the soil warms up to 10 degrees. Gardeners determine the optimal time for dandelions: as soon as they bloom - time to plant rose bushes. Grafted seedlings are planted first, because the rose hip is not afraid of sudden late frosts. Non-grafted roses - not before May 15. Maximum planting time - on 15 June. If late, Rose did not have time to get stronger during the short summer and leave the winter without lignified stem. So, it is easy vymerznet. Siberian planting roses is not much different fromother areas. Barbed beauties like slightly acidic soil rich in humus. The basis of the soil can be loam. Good landing lay on the bottom of the pit and covered with earth rotted horse manure, which will warm the roots. Right in the bushes do not put manure, so as not to burn the young roots. The optimum composition of the earth: 1 part clay and 1 part sand + 3 + 2 parts humus of the peat + 0.5 parts of wood ash. Not bad, if the right will make a special fertilizer for roses. The depth of the landing pit - at least half a meter. Purchased seedlings are dipped in a solution of water with a growth factor for 3-4 hours, so that they were filled with moisture. Too long roots (above 20 cm) is shortened, stimulating the growth of lateral roots. Remove from the aerial parts of paraffin and lightly pruned branches (up to a healthy green color). The most important point is slightly recessed landing. Many growers in Siberia discovered that tea,English varieties floribunda and survive better in cold, if the location is not in the grafting of 5 cm under the soil level, and 7-8 cm, ie a little deeper. 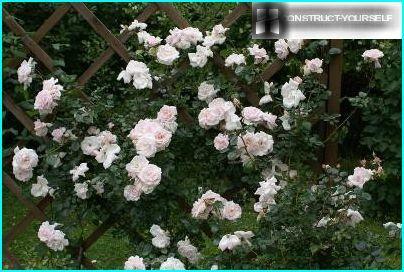 Accordingly, for the climbing roses should be 12-15 cm. These can be weaker than the landing harbor, and some owners and does have refused shelter by buying varieties with high resistance to frost. 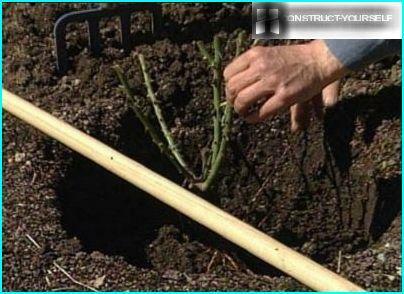 When planting rose roots straighten so that theyIt was only downward, but not wrapped ring. This arrangement can help planting mound: in the bottom of the pit pour gorochkoy fertile soil, put it on top of the seedling roots straighten along the hill and sprinkle. When planting, watering mound after a rose planted. In normal landing - you can first shed the roots, and then fall asleep ground. After landing on the bush certainly spudheight 15 cm. It is necessary that the water does not evaporate quickly. The land also will protect delicate sprigs from the sun, because at the moment they are the healing very quickly dry up. 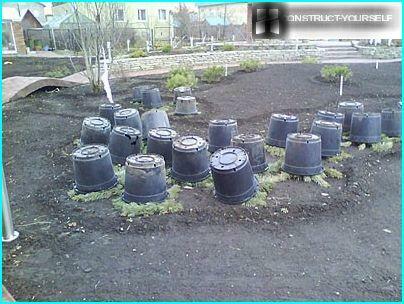 In the northernmost regions of landing harbor lutrasilom to protect from night frosts. To cultivation of roses in Siberia was finishedfreezing out of the bushes in the first winter, gardeners have come up with a lot of different options for shelter. Their similarity is that for the roses in a cold climate it is necessary to create a dry shelter, ie each seedling to protect the top with waterproof material. 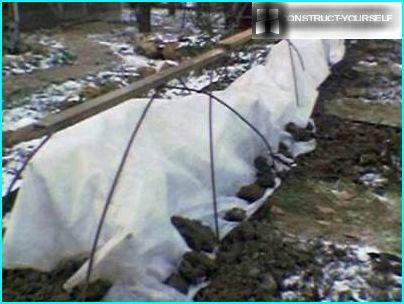 It will protect the plant from moisture, which instantly turns into ice. "Snow Blanket". If your location has consistently snowy winters,the snow throwing by on every bush - the perfect hiding place. After all, in Siberia as the snow falls, and lies until spring, so that it is always under stable temperature. "The skeleton of plastic edges." Make a frame made of two intersecting arcs,put on a rose bush is filled halfway with dry earth or leaves are covered with a double layer of spunbond top or lutrasila, on top of which is required to spread a film so that it captured part of the soil. Sprinkle with ground edges of the film. Prior to the onset of stable frost, the film should be slightly opened to the stems not vypreli. "House of polycarbonate." Instead of plastic arcs put on rose two piecespolycarbonate, fastened at the top with string. It turns out house. Top harbor lutrasilom and film. But the film ends is closed only after the onset of frost. 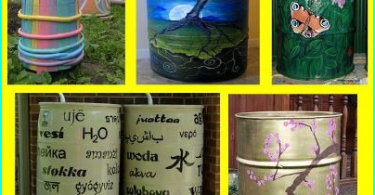 "From plastic buckets." Every bush hilling to a height of 20 cm, legs draped spruce top and cover with plastic containers without holes. In any type of shelter in early spring, manySiberians repeatedly shed soil Appin to revive their pets. Grateful rose endows the hosts abundant flowering and fragrant, although the nature of them contributed to it very little time.